The PhD in Education program is designed for individuals with a commitment to applying a multidisciplinary view of theory and research. Our students bring a wealth of personal and professional experience to their studies, as well as a commitment to scholarly endeavors. Secondary emphasis in an area either within or outside of education (12 credits). Research core courses are designed to prepare students to evaluate and investigate a range of research approaches and apply qualitative and quantitative data collection and analyses appropriate to research in education. EDRS 810: Problems and Methods in Education Research is taken the first or second semester as a cohort class. *Students pursuing the Kinesiology Concentration must select these course options. Through seminars, courses, internships, and independent studies, students acquire the knowledge and technical skills requisite to a chosen educational specialization. Students may specialize in any of a variety of professional areas. 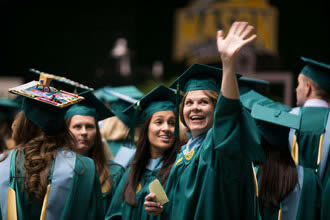 All students in the PhD in Education and Human Development program in the Graduate School of Education at George Mason University are required to have a secondary emphasis area of scholarship in addition to a major or professional specialization area of study in education. The purpose of the PhD secondary emphasis requirement is to ensure that each student has adequate exposure to the concepts and research methods of a specialty or a coherent interdisciplinary field of study which is relevant to the field of specialization in education. The PhD in Education Portfolio is an organized, yet selective collection of documents designed to facilitate a student's academic and professional development and to provide a basis for evaluating degree progress. The portfolio represents the scope and depth of a student's goals, plans, and accomplishments in coursework, independent study, research, internships, and other advanced learning activities. The portfolio thus provides both a vehicle for self-reflection and a comprehensive record of a doctoral student's experiences and ongoing progress toward his or her academic and professional goals. See the Documents for Current Students page for current forms. As candidates for the doctorate, students take a dissertation seminar to design a dissertation. The dissertation demonstrates a student's mastery of the knowledge and skills developed in his/her particular program of study. After completing the dissertation, each student must present satisfactory oral defense of it to complete the program. Upon successful completion of the dissertation and an oral examination, the faculty recommends the student for the Doctor of Philosophy in Education degree.